On leaving San Diego, I had no clear plan on where I was going nor where I might spend the night. 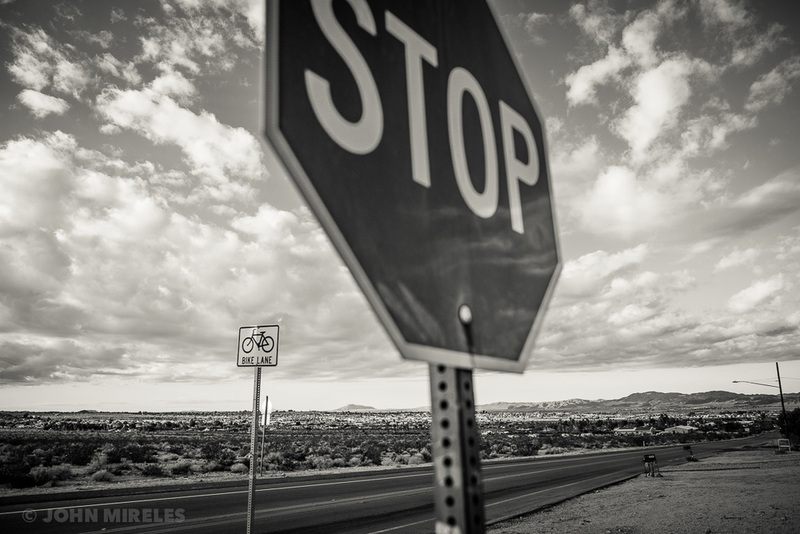 So, like a horse heading to the barn, I pointed my home on wheels to Joshua Tree National Park. Not only is it a beautiful location with its spindly yucca-like trees and odd piles of golden-brown rocks, it's also the site of many of my past climbing adventures and, as much as I don't ascribe to such things, a spiritual home for me. I figured that I could unwind for a night or two then figure out where to go from there. What I didn't count on when I arrived was just how cold it turned out to be. Though I enjoy some crisp cold weather as an occasional antidote to my usual perfect San Diego weather, what I learned that it's darn hard to write when the air is cold. Writing is a solitary, don't-move-very-much exercise. It's not easy to write with cold fingers and well, cold everything. Given that part of the reason I decided to escape into the wild was so that I could focus on some of my writing projects (book proposal and whatnot), this was a problem. The morning of the second day, I decided to throw in the towel. See ya Joshua Tree. Not an easy decision since, as a a campfire whore who'll make friends with whomever boasts the tallest flames from their fire ring, I'd already made several friends in the climber's camp, Hidden Valley. But I'm a man with a mission and I'm prone to bouts of determination. I rolled off the campsite dirt and back on to the highway pavement; my destination the high-desert town of 29 Palms. Before I continue, I should mention that I've had this idea for a photo project that I've been mulling over for the last couple of months. After traveling 3,000 miles there and back from the Bakken area of North Dakota, the thought crossed my mind that I might consider taking on a project a little closer to home. I dusted off an old idea that I'd had to photograph communities in the desert that lay along the highway - from 29 Palms on one end to Palm Springs on the other. Given that the towns lay pretty much in my backyard, the logistics of it certainly appealed to me. 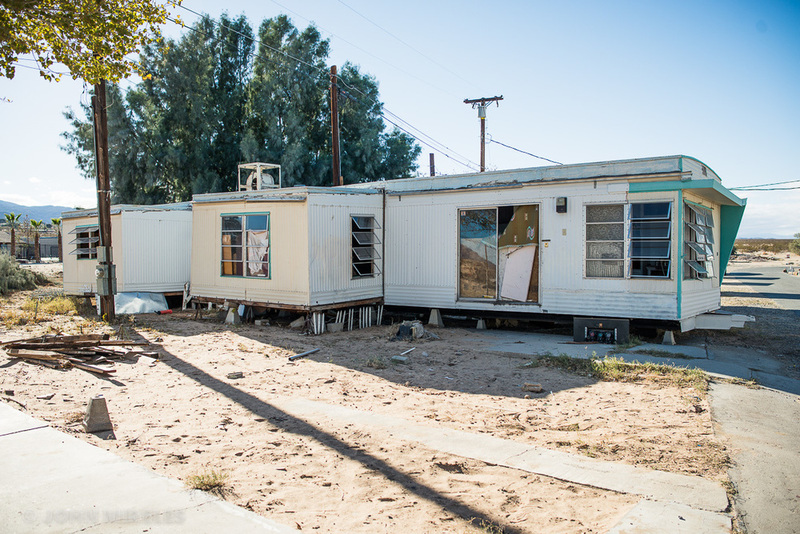 Beyond the convenience of the locations, what attracted me to this project was the diversity and distinctiveness of each of the communities that lay alongside the highway that connected them. 29 Palms owes its continued existence to the Marine base that lies at its doorstep. It's a tough town renowned for its desert rats - crusty old timers who've escaped city life - and many crystal meth heads brewing up God-knows-what out in the desert (and stealing anything not nailed down). In contrast, Palm Springs is moneyed, gay and increasingly hip. Further down the road, the well-to-do retirement communities of La Quinta and Cathedral City sprawl out over a desert floor that bears no interest in limiting their growth. In acts seemingly of magic, their lush, green golf courses thrive amid the blisteringly hot desert sands. Continuing on, California's larges lake, the Salton Sea, provides both beauty and a harsh reality. Abhorrently smelly from repeated fish die-offs that strike this dying lake, the only souls remaining at its shores are those with no place left to go. Finally, America ends and Mexico begins amidst the green agricultural lands surrounding the Hispanic dominated towns of Blythe and Calexico. Though much of the nation's winter vegetables emanate from this area of the Imperial Valley, it also boasts some of the highest unemployment in the country - up near 30%. As I began this trip, I did so with an eye towards attacking this project. However, as I ambled towards my first stop, 29 Palms, I did so with hesitance, even trepidation. You see, working as I do - in close and intruding into people's lives - is psychologically demanding. It takes enormous energy for an introvert like me to connect with all manner of people to secure my prized photos. The process is a bit exhausting and, much like a prize fight or big game, I need to be mentally prepared for the task. Driving through the shrubby high-desert landscape, I sort of felt like I was three months into a six month training program. Nothing new there however: unprepared and improvise are my middle names. I drove on. Arriving in outskirts of town, my excitement grew as I saw that everywhere I looked there lay the makings of a good story. Sun baked old houses. Kitschy decor. And a quiet irony that's no doubt unseen by most of the locals. (What irony you say? How about a "combat haircut" barber shop that advertises itself as a nightclub too.) I soon saw my first potential subject: a man gathering not-sure-what from alongside the street. I pulled my RV to the curb and approached the man, camera in hand. As I did, another man who'd just exited his car to enter a house on the street excitedly asked, "What are you taking pictures of?" Happy to oblige, I shared the rough outlines of my photo project with him. I explained that the main highway that led through town served as river that linked the various towns that lay long its path. My goal was to document the life along the way and hopefully put it into book form. Happily for me, that idea struck him as the most obvious idea in the world. He blurted out his approval with another question, "What' the name of your book?" Now, for that, I had no ready answer. I admitted that I had no name in mind since this project was still in its nascent stages. Andy, chuckling in a way that was both welcoming and empathetic, took to my idea of a river in a obvious way. "You know that the Mojave River runs underground from here. Course, it goes north from here so that doesn't help you too much..."
No sooner had the words escaped his lips than there it was, the working title for my project. It flashed in my mind and stuck. What serendipity! Here I am at my first stop and out comes both a name and a concept. There's nothing like some initial success and inspiration to kickstart my lust for a project. I ended up photographing Andy along with the woman who lived in the house he was visiting. From there, I photographed his friend Chris, another affable if hyperactive character, and his girlfriend/neighbor at their houses on the other side of town. Never have I been so quickly welcomed into a foreign town. Though I don't expect such easy fortune to continue, it sure is nice to ride that wave for as long as it continues to curl. And yes, my project has a name. As I mentioned, the highway that I'll be following links my towns much like a river. But not only is there no actual river to see, the thread that links these towns is not immediately obvious either. What I saw clearly as I chatted with a stranger outside his plywood covered house was that, as I progress in this journey, I'll be following an invisible river. There it is - coming soon to a gallery and bookstore near you: The Invisible River.